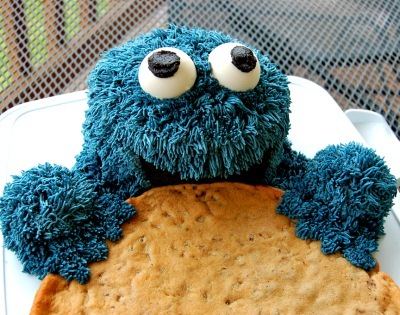 Cookie Monster Cakes are perfect for the Sesame Street Lover. This one was graciously shared by a mom who made if for her son's second birthday. A Wilton 502-7415, 1981 pan was used for this cake. Although it may not be readily available at stores now, you may be able to find one on Amazon used or on eBay. Use your favorite cake mix and a frosting tip to achieve this wonderful "furry" cake! Looks almost too cute to eat! Cookie Monster Eating a Huge Cookie! 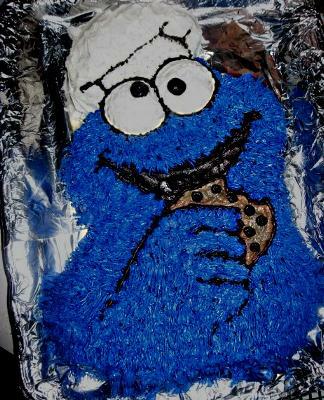 What a cute idea...Cookie Monster eating a BIG cookie!! Decorate the cookie with icing to write your birthday message or a have your child help you make this for Father's Day. To make the Cookie Monster, stack two 6" cake layers and do not cut off the "dome" on the top one to give it a little bit of a curve. Use black icing for the mouth before adding the "fur". Use Wilton tip #233 (the "grass" tip) with buttercream icing for the fur. It's best to start at the base and work your way up to the top. The eyes are made from Wilton Candy Melts, using a cookie scoop (the kind with the scraper bar that you squeeze to drop the dough) and when the Candy Melts harden, use the scraper to release the "eyes" from the scoop. The indentation from the scraper bar will be hidden in the fur, so you won't be able to see it. Use dark chocolate for the pupil and then add the white. When I originally made it, I just made the whole thing white and added black icing on top. It makes a solid chunk of candy, so you need to make sure to keep them away from little ones that might choke on them. Or, you can "paint" the scoop with the candy melts so that the eyes are more hollow. Or just make flat disks for the eyes. Use cupcakes for Cookie Monster's hands. Be sure to check out other cool cake ideas on Tiffany's Facebook Page Kirby Creations and "Like" her page!